People come to counselling with a variety of difficulties including depression, anxiety and stress. They may be overwhelmed by their feelings, unable to cope, having relationship difficulties or low self-esteem. They may have experienced difficult life events such as bereavement, divorce or trauma. Counselling provides a space for people to explore such difficulties and work through painful experiences in a safe, private and confidential environment. Counsellors will be accepting and understanding allowing you the freedom to explore and reflect on what’s right for you. Our comprehensive assessment process provides and opportunity for you to find out about our service to make sure we are the right service for you. 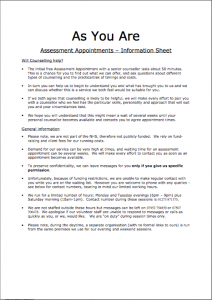 We will also use the assessment process to find out more about you and what you hope to gain from therapy. We aim to be an affordable service and you will be asked to make a contribution that reflects one of these pay brackets. The cost of assessments will cover the assessment and our allocation process. Confidentiality will be discussed at assessment. To arrange an assessment please call Nicky Hitchcock on 07952 754859. You can also contact us at the Corner House on 01273 871575 on Monday and Tuesday evenings between 6pm and 9pm. As You Are operates a sliding scale of £8.00 to £35.00 per session for individual sessions and £16 to £40 for Couples sessions. The fees are based on the client’s ability to pay. We offer up to 24 weeks of therapy in a private and confidential setting. Each session last for 50 minutes and availability will be discussed at assessment. All our counsellors are professionally trained or on a recognised training course and supported by supervision. 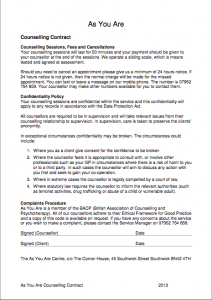 As You Are is a member of the BACP (British Association for Counselling and Psychotherapy) and we adhere to their Ethical Framework for Good Practice. Visit BACP website for further details. As You Are also now offer private practice counselling. For more information on this service, visit our Private Practice page. In addition to the counselling services available at As You Are, you may also like to look at the Counselling Directory. The Counselling Directory is a confidential service that encourages those in need to seek help. You can visit their website, enter your postcode and find a qualified counsellor or psychotherapist nearby who specialises in the area of need. Their site also serves as an information hub for people to read mental health-related articles and news, as well as to find local events. Their website can be found here: Counselling Directory.